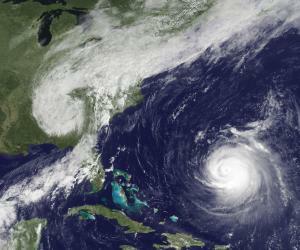 As of now two cyclones are spinning in the Atlantic ocean; one is Hurricane Katia while other is tropical storm Maria. On the other side of the world, Tropical storm Kulap is brewing in the Pacific ocean. Maria and Kulap are expected to make landfall while Katia is heading in open waters. Overall 3 active cyclones can be seen on the planet as of September 7. As of now a total of 14 tropical depressions formed in the Atlantic ocean out of those 13 intensified into tropical storm strength. Only 2 intensified into a hurricane and then a Major hurricane. One was Hurricane Irene while the other is Hurricane Katia. 85 mph winds, intensity dropping! Katia is the strongest hurricane of the current tropical season in the Atlantic ocean, it was a category-4 hurricane few days back. Tropical warning has been issued for Bermuda, where some storm-line conditions are expected in 48 hours while one person died in Florida due to strong waves. 50 mph winds, could intensify! Tropical Storm Maria could threaten Puerto Rico this weekend, but forecasters say it’s still too early. Maria could move westwards and threaten any land or it could also follow similar path as compared that of Katia. Tropical storm Nate may also form in coming days as a fresh tropical disturbance moved to the open sea waters. A total of 26 tropical depression formed, out of which 14 gained tropical strength while 5 reached typhoon strength. Only 3 storms became Super typhoon. Songda, Mufia and Nanmadol were the strongest typhoons of the current tropical activity. 50 mph winds, will intensify further! Tropical storm Kulap could become a category-1 typhoon before hitting China on September 12. There is a threat of flooding that is why authorities in China are on alert for the expected typhoon. ← Heavy downpour in Karachi!